The construction of Metro-2B has courted controversy after residents from Bandra, Khar and Juhu challenged the construction of Metro-2B on the ground instead of underground. 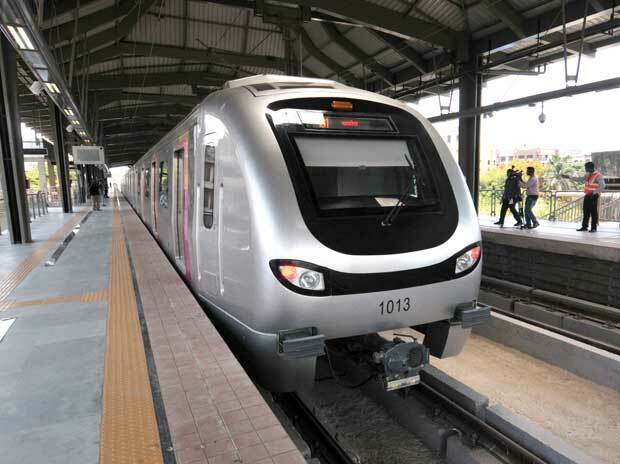 Mumbai: While protests by citizens and court cases have slowed down the pace of civil construction work on DN Nagar-Mandale Metro-2B, the Mumbai Metropolitan Region Development Authority (MMRDA) opines that the delay may cost them a loss of Rs 3 crore per day. Currently, the civil construction work is delayed by around three to four months at least. High Court’s stay on construction work except that for utilities and conducting soil testing has led to the delay. If its delayed further, it may result in cost escalation of Metro-2B, fears MMRDA. “After residents from Bandra, Khar and Juhu challenged the construction of Metro-2B on the ground instead of underground, the matter is with the HC. The case is in court since May 2018, and this has delayed our work by around 3-4 months. We will have to bear the cost of around Rs 3 crore daily as contractors are not able to do piling work in places which have been barricaded,” an MMRDA official said. The total project cost of Metro-2B is Rs 10,986 crore of which civil construction is funded by MMRDA, and rest is being funded by the Asian Development Bank in form of a loan. The Metro-2B DN Nagar-Mandale corridor is 23.5-km-long and the DN Nagar-Mandale Metro corridor is a part of the Metro-2 (Dahisar-Charkop-Bandra-Mandale), which was earlier planned underground but was later turned into an elevated corridor. The line was also divided into two parts namely Dahisar-DN Nagar Metro-2A, DN Nagar-Mandale Metro-2B. Meanwhile, earlier the same issue of cost escalation due to legal tangles was also faced by Mumbai Metro Rail Corporation (MMRC) constructing the Colaba-Seepz Metro-3 underground corridor. Due to a stay on felling of trees for the project, the MMRC had claimed it suffered a loss of Rs 4 crore daily. The total cost of Metro-3 is estimated to be around Rs 23,000 crore that is funded by Japanese International Cooperation Agency.